The Muppets are at it again. The clever new caper takes us to a gulag in Siberia, Russia and several other international cities, as The Muppet Show reunites for a world tour. But all is not as it seems. All is not well. Constantine–the World’s Most Dangerous Frog–who looks exactly like Kermit, but with a dark mole above his lip and a thick Russian accent, has Kermit kidnapped so that he can take his place and steal England’s crown jewels during the Muppets traveling show. Kermit winds up in Constantine’s place at the gulag. Ricky Gervais plays “Mr. Badguy” a conniving talent agent (in cahoots with Constantine) who makes the Muppets think they are selling out every venue (he’s actually giving tickets away free) just so they can eventually wind up in London in a venue next to the Tower of London which houses the gems. 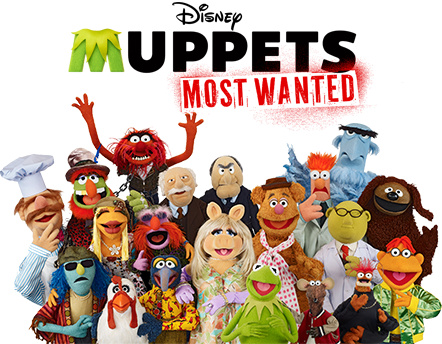 As always in a Muppets flick, there are cameos after cameos by all kinds of big name stars–too many to name–sometimes just appearing for a few seconds on screen. For example, when an usher is needed, Usher shows up. But the show stopper is Tina Fey as a tough Russian guard at the gulag who takes a shining to Kermit, and therefore never wants to let him go. Her accent and facial expressions are deliciously funny as she generously embraces the role and lets herself go. Russia seems to be Hollywood’s favorite go-to “evil nemesis” nation as evidenced by Despicable Me and other live action films. Another hilarious pairing is Sam Eagle (playing a CIA agent) with a French Interpol agent “Jean” (Ty Burrell) who Sam Eagle keeps calling “Sean.” Besides being in constant competition, the French agent is always taking exceedingly long lunches, ending his workday early and just always being terribly French. Russian and French accents never get old for laughs. The delightful signature Muppet show tunes (almost vaudevillian) are spot on, starting with two introductory songs about making this sequel: “They’ve Ordered a Sequel” and “We’re Doing a Sequel.” (Welcome to) “The Big House” (the gulag) is a fantastic true blue disco number, and “Working in the Coal Mine” (the actual R & B hit) is amusingly sung/danced by the gulag inmates. You gotta hand it to them: the Muppets really handle musicals well. As the plot thickens, Constantine proposes to Miss Piggy (who thinks he’s Kermit). Will the wedding of the millennium finally take place?! If so, will the groom be Constantine or Kermit?! As much fun as this movie is–especially all the gulag scenes–the repetitive Muppet formula of “how do we stay together as one big happy Muppet family forever?” feels hackneyed and predictable. The poignant message of Muppets Most Wanted is a question that will naturally spring up in the mind of the audience: how could the Muppets not know that Constantine was NOT Kermit (despite the green makeup covering his mole and accounting for his strange accent by saying he had a cold)? Is Kermit so easily replaceable? Even Miss Piggy is fooled, although she feels that something is not right. 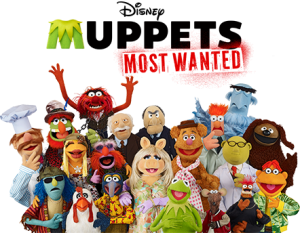 Before Kermit knows that he has been replaced by Constantine he simply thinks his friends have forgotten about him. Another message is that wolves can come in sugar daddy clothing. Mr. Badguy let the Muppets do whatever they wanted and promised them the moon, while Kermit was a realistic, loving disciplinarian. Many of the jokes and messages are slow and spelled all the way out (obviously for the kids in the audience), but it isn’t terribly distracting for adults. Muppets Most Wanted is truly PG. Nothing questionable or objectionable. And all in good taste.